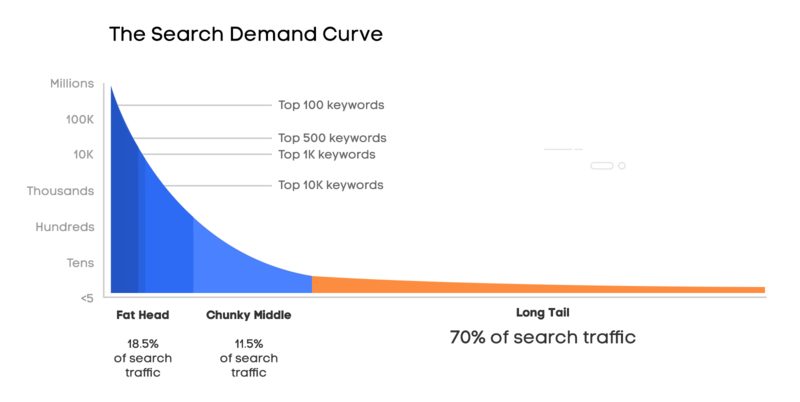 Great post from AHREFs breaking down long tail keywords, and why they are so important. Low search volume, high specificity. But why should you even care about a keyword that gets 25 searches per month? Because, typically, combined long tail searches make up about 70% of a site’s organic traffic. The bulk of this article, though, is about rethinking how one should approach long tail keywords. Because Google’s algorithms are a lot smarter now than their early 2000s “this-page-is-stuffed-with-keywords-it-must-be-super-relevant” algorithms. You don’t need to have your page include a particular keyword to rank for that keyword and similar phrases (though, at this point, it’s still advised to mention the keywords you’re targeting, within reason). Hummingbird changed the content/keyword when that algorithm came out, and keyword and content best practices are evolving to focus on in-depth explorations of a topic, vs. individually targeting keywords. For some step-by-step instructions on how to search for and put together strong content that takes all of this into account, click through and check out the end of the post. Good stuff from ahrefs.com, as usual. …early in 2017, we will only promote hosting partners that provide a SSL certificate by default in their accounts. Later we will begin to assess which features, such as API authentication, would benefit the most from SSL and make them only enabled when SSL is there. For most of you reading this, WordPress’s announcement won’t actual impact you directly. But if you’ve been putting off switching your site to SSL (which, yes, it’s been said that doing so will give your site an SEO boost–but it is not without its headaches), consider this another novel’s-worth of writing on the wall. You can choose which kinds of Google My Business notifications you receive on your mobile device and in your email inbox. Notifications can help in a variety of ways, like letting you know when customers leave photos or reviews for your business listing, alerting you to product news from Google, and reminding you to keep your listing up-to-date. Product updates, listing help, customer uploads a photo… you can now let Google deeper into your life with Google My Business (GMB) notifications for a list of things. Click through to see the full set. Overdosing on pop-ups, bait and switch content, doing one of any number of things to damage your website’s trust is SEO suicide. You could have a powerful link profile, but if visitors run back to Google after a few seconds of being on your site, not even that .gov links you’ve been scheming to get will save you. This article lists several things that could damage the trustworthiness of your site. Collect all seven! Be careful with the ad content that displays on your website. Yes, banner and pop-up ads can help you generate extra revenue through your company website… but at what cost? A site that’s overloaded with ads for off-site products is going to come across as unprofessional, if not outright spammy. Ditch the ads. Make sure your whole site is just about you and your customer. Consider this list a starting point for trust. There’s still a lot you can do to help your site outside of the points listed on SEMrush. It’s interesting to see some implications of SEO in the “real world” a.k.a. something your parents might have heard of vs. your affiliate site. Fake news continues to be a hot topic. This story talks about how fake news inspires more user engagement than less-flashy actual news, and that some Google ranking signals reinforce fake news and it ends up ranking better. As if SEO needed another black eye! Some experts are tracing the start of this craziness back to the often-misunderstood implementation of rank brain a year ago. So why or how is this important to you, and your SEO efforts? SEO is (still) not dead. Links matter, yes, but trust signals (a.k.a. user engagment signals) also matter–see above story. You don’t have to be white hat to rank well in Google (is fake news non-white hat? Probably…). If you’re looking for someone to take over your link building for you, find out how RankBOSS can help. You cannot do anything with the default pages (/cart, /orders, /shop, etc. ), and the old path has to no longer exist. Google is retiring “phone-tools” in Search Console.